[Video] Here's how cops can make your life absolute hell, even if you obey all rules! [Video] Here’s how cops can make your life absolute hell, even if you obey all rules! Traffic police personnel in almost all parts of India are routinely known to harass motorists, especially those traveling inter-state. Here is a chilling video that shows to what extent cops can go to extort and harass hapless motorists. 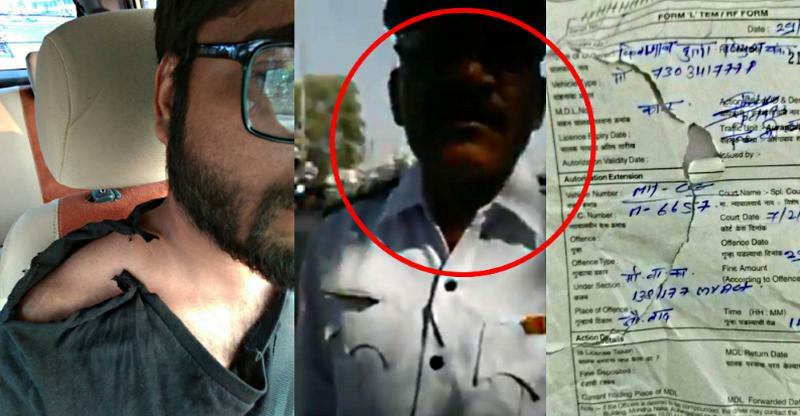 Here’s a full account of what happened by Nirmaan Dutta, the motorist who was harassed at Maharashtra’s Aurangabad district, while he was on his way from Bhilai, Chattisgarh, to Mumbai, Maharashtra. I’m writing this post to put light on the rampant corruption and harassment by traffic police due to public’s lack of awareness of traffic rules and regulations. In the wake of making roads more safe for public, most of the traffic policemen use these laws to harass and extort money from public. To avoid the legal hassle, I agreed to pay the fine but demanded a legitimate payment receipt. This infuriated them and they started threatening me by saying that even my vehicle would now be seized. When the harassment crossed the threshold, I started recording it on my phone. Afraid of getting exposed, he (one of the cops) threw my phone, didn’t let me record and assaulted me to retrieve the phone and delete the video. During the assault, my shirt tore and the challan copy was crumpled. I managed to escape further assault due to the public gathering, and was asked to go to the policemen’s office to pay the fine and take back my seized documents. It took me 2 and half hours to find the office in an unknown city, and when I complained about this matter to the superior, even he accused me of ‘tearing up the challan on purpose, refusing to pay the fine and threatened legal action’. I pleaded my innocence, and finally paid the fine after an hour of intense drama and a stern warning not to escalate the matter further. Finally, the entire incident ended up extending my journey by 4 hours, and a fine of Rs. 200. Yes, Rs. 200 was the final fine I had to pay but for a false accusation. I guess driving an out of state vehicle made me a soft target. The prime reason for this post is to start a discussion on the issue of police harassment and corruption at the grassroots level. Being a highly educated and aware citizen, if such a thing can happen to me, I can only imagine the plight of less fortunate citizens. Worst of all, such matters mostly go unreported.